In Soviet times, Russia's gay scene was completely underground. After perestroyka, attitudes towards and laws about homosexuality started to change, and, in 1993, was decriminalised. In a lot of ways, Russia remains more conservative than most European countries, which may be why the gay scene in St. Petersburg is smaller and more hidden than you would expect for a city of almost five million. I will assist you with trying to meet the local Gay population in the city. Also, you may meet someone of interest at the local bars and Bath houses. Prepare yourself for a good time. 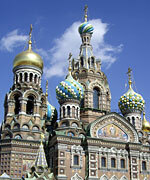 The club is located in the heart of the City close to Nevsky prospect. It features great looking dancers who you might wish to feed fruit. With a capacity of 500 it usually draws large good looking crowds. I recommend a visit. THe club is opened at 11 pm. Don't wait too long to visit Cabaret, the best(?) gay place in town. The club is located near the metro station Ligovky prospect. After midnight a colorful transvestite show starts, but before and after the performing drag queens you can dance, dance, dance. We did not enter the dark room, but we know from stories that it can be pretty thrilling there. - location: 1 Lomonosova ul., door 69 (30 meters from the gay club Central Station) and next to the oldest shopping center "Gostiny Dvor"
- Free entrance. Find the door with the number 69 on it and ring the bell. Friendly security guy will open the door. Thanks to the "face control" - only nice people are allowed to get into the bar. Bunker is located on the Embankment of Fontanka river. There is a bar where you can meet people and watch gay videos, private rooms, showers, pleasant atmosphere. It is traditional Russian bathhouse (not gay sauna). Men come here for health improvement. In the steam room everyone uses birch branches. This banya (bathhouse) is good to visit on Tuesday from 7 pm till 9 pm when everyone has a chance to see naked 18-22 y.o. cadets from Naval Academy, which is located nearby.